Wanting a quick timeout? Here’s a perfect way to relax while waiting for a loved one or for those who have never tried massage. Use our self care tools to relax with. You can use them at the same time or switch between them. SEVERAL TOOLS TO CHOOSE FROM! 16 DEEP TISSUE MASSAGING NODES – The neck massager area is equipped with 2 big and 2 small nodes which provide deep tissue massaging for the neck and shoulders. The back massager area has a total of 14 massaging nodes which effectively release stress, relieve sore muscles, and help relax. 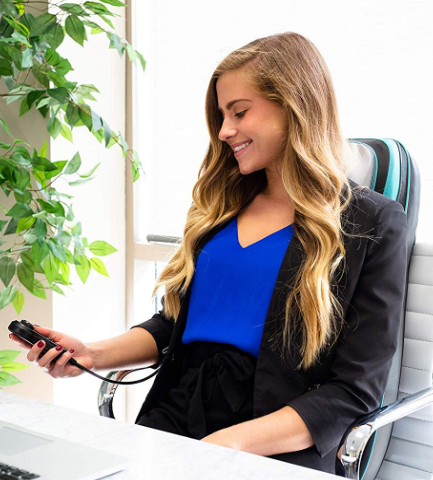 REMOTE FOR ADJUSTABLE INTENSITY – This seat massager comes with a remote controller that has a speed joystick which allows you to get the right and appropriate amount of pressure to relieve your muscle pain. HEAT FUNCTION – With infrared heat, this Shiatsu back massager can be used to ease muscle tension, stress and promote blood circulation. ATTACHABLE SEAT WITH VIBRATION – The Shiatsu back massager can be used with or without the seat cushion pad. The seat pad can be connected or disconnected from the back massager easily, and it has a vibration feature which will help promote circulation and relieve sore glute muscles. 2 MASSAGE DIRECTIONS – built in a Bi-directional movement control to mimic the motion of in-person massage experience. This seat cushion massager comes with a controller that will allow you to change the massaging direction for better distribution of massage effects. 8 MASSAGE ROLLER BALLS – This shoulder massager comes with 4 big nodes and 4 small nodes, which provide deep tissue massages on your neck, shoulders, upper back, lower back, waist, foot, tights, calves, legs, feet and arms – helping your full body parts to release stress, relieve sore muscles, and help you relax. ADJUSTABLE INTENSITY – This neck massager pad has 3 speed strength levels, which allow you to get the right and appropriate amount of pressure to relieve your muscle pain. MASSAGE DIRECTIONS – built in a Bi-directional movement control to mimic the motion of in-person massage experience. This 3D shiatsu massager will auto-reverse each minute for better distribution of massage effects. HEAT FUNCTION – Improve blood circulation, relieve muscle tension, tired feet, neuropathy, chronic nerve pain and plantar fasciitis by turning on the heat function. ADJUSTABLE INTENSITY – Whether you just want an easy relaxing leg massage, or a deep tissue shiatsu kneading massage – you can easily adjust the intensity of the message and choose between 3 different pressure levels! SHIATSU MASSAGE & AIR COMPRESSION – 2 independent foot chambers provide a wonderful combination of shiatsu kneading and rolling massage therapy, while the air pressure applies pressure to all parts of the foot. BI-DIRECTIONAL MASSAGING MODE + “SOLO” AIR COMPRESSION MODE – this massager provides a bi-directional massaging experience, you can change the kneading direction in a press of a button. There is also an extra mode for only air compression with no Kneading. The foot massager has many mini Ergonomics massage heads, which can massage more acupuncture points. 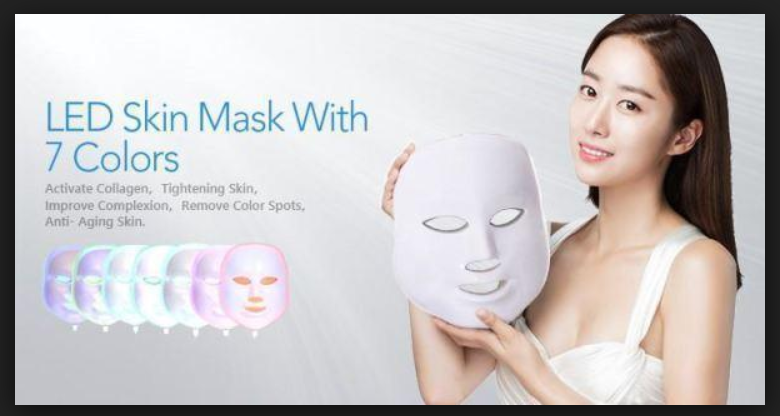 QUALITY SKIN TREATMENT: A one stop solution to all your skincare needs, this LED light therapy mask provides you 7 different light colors to treat a myriad of skin problems. Our UV Free non-heat producing LED’s penetrate your facial tissue to boost collagen, clear acne and tighten your skin, reduce lines and wrinkles, balances skin tone, sun spots and much more. MULTI-FUNCTION: Our LED Facial Beauty Mask produces 7 different color LED lights that will fight skin aging for the rest of your life! Each non-heat producing and radiation-free natural light offers effective results for practically all skin problems. HOW IT WORKS: Special LED wavelengths (nm) stimulate the mitochondria cells to produce ATP, which is essential to build collagen and make your face look young, juicy and wrinkle free. Once light is absorbed by the skin, it produces light energy which is then converted to cell energy to grow fiber cells, tissue & collagen. It increases skin elasticity and helps to repair aging skin, acne, age spots and assists to improve firmness. PROVEN: This medical Red Light Therapy device has proven to reduce the appearance of puffy eyes, dark circles under the eyes, smile lines, crow’s feets, brow lines and more. It can also improve overall skin tone and reduce the appearance of scars. MAKE YOUR SESSION EXTRA SPECIAL WITH ONE OF OUR PACKAGE ADDITIONS! Includes Non Contact Aromatherapy and Warmed Heat Packs & Stones.